Learning and experiencing art is what we at Artsworth do. 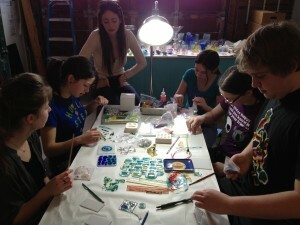 By providing unique workshops to our community members, whether they are children, teenagers, or adults, we are able to open the doors to creativity and show all who wish to learn about the beauty of crafting high quality work with your hands and heart. 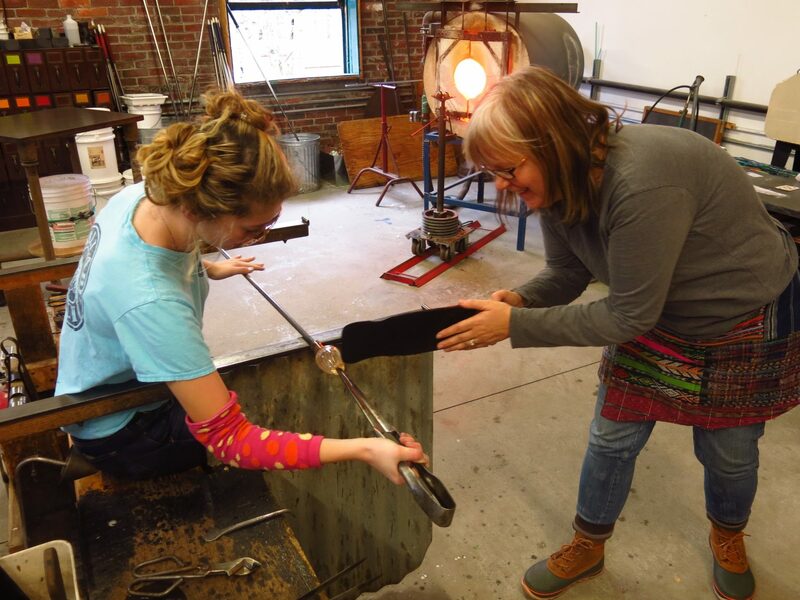 Workshops are held at 25 Pine Street and range from learning about how to manipulate molten glass to how to solder metal to how to sculpt out of clay or fiber. Our goal is to remain open to suggestions and ideas of how to meet the interests and needs of our community by providing a space for all teachers to share their craft with students of all ages. We hope that if you have a great idea that you wish to share with others, that you will come to Artsworth, share our space and share with us. Below you will find a list of current offerings: check back as our list is always changing! Teach a workshop! Minimum age 12. Participants under 18 must be accompanied by an adult. Call 207-664-0222 to reserve a spot or click the button below to sign up online! Make something really special - a gift from the heart! You will transform molten glass into a small solid heart shaped paperweight with our expert help. 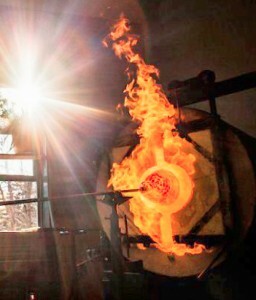 This experience allows you to work with hot glass up close, with help from our glassblowers. 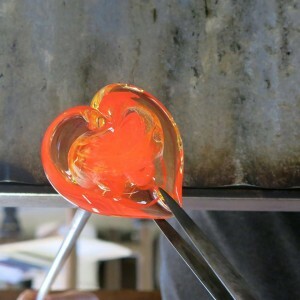 You’ll start by choosing the glass colors you want to use in your solid glass heart, and then partner with our professional glassblowers to create it. 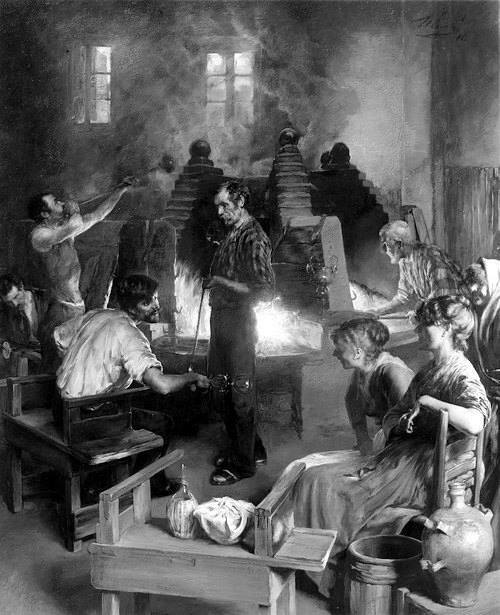 After applying and heating the colors you will sit at the glassblowing bench and learn how to use the “pucinellas” to shape and swirl the molten glass. When the interior design is complete, the glass will be cased in clear crystal, and shaped into its final heart form. Although this is a swift exercise it reveals ancient glass techniques, that are a true wonder to experience. Age Restriction -14 years or older, under 18 accompanied by an adult. Call 207.664.0222 to reserve a spot. 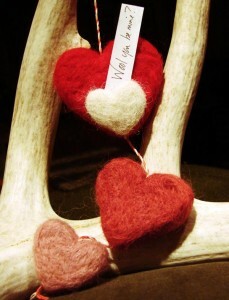 Everybody has a special person in their life that deserves a handmade valentine. Join us on February 11th to make something unique for someone special during our open valentine making studio. For $5, we'll provide a variety of materials (paper, paint, stamps, stencils, and more) for participants to make up to 3 valentines. There will no formal instruction, although staff members will be around to help orient you and be a creative resource. Our glass studio will also be fired up for our Heart of Glass workshop, so the space is sure to be warm and full of creative energy! The valentine studio will be open from 10-2. Drop in at your leisure! Additional valentines can be made for an additional donation, depending on materials. Saturdays • February 18th- March 11th • 10 a.m.-2 p.m. This course is designed for beginners. Emphasis is placed on learning the basic skills necessary to complete simple blown vessels. Class time is divided between demonstrations and supervised work time with individual attention for each student. No glass working experience is required. This is a four week course meeting once each week for four hours. Registration is on a first come first served basis, as class sizes are limited. You must be 14 years of age or older, under 18 must be accompanied by an adult. Full payment is expected by the first session. Call 207-664-0222 to sign up! 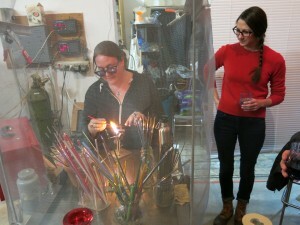 This experience introduces you to the basics of flameworking and offers a focused experience with hot glass. Tara Parker demonstrates how to work with molten glass at the torch, and guides you through the process of making one of your very own glass beads. 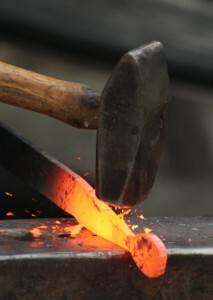 You’ll start by turning a mandrel - a metal rod used in beadmaking - in the flame. 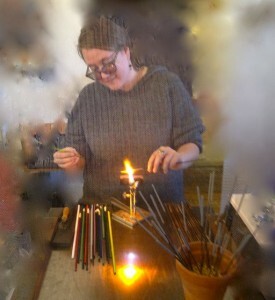 Melting colored glass rods in the flame and applying the molten glass to your mandrel will create your bead design. How you wind the glass onto the mandrel makes patterns and beautiful unique glassy designs. Students should expect to spend one hour in the workshop as Tara makes her way to your turn the actual time spent making a bead is a fairly swift process and usually takes about 20- minutes. Pieces must cool overnight and can be picked up the next day, or shipped within the US and Canada at no additional cost. Saturday, March 4th • 5 p.m.
Ms Maxine, an eccentrically endearing music teacher, is missing and it’s up to her students to find her. Along the way they run into creatures, spirits, witches, and even a princess! 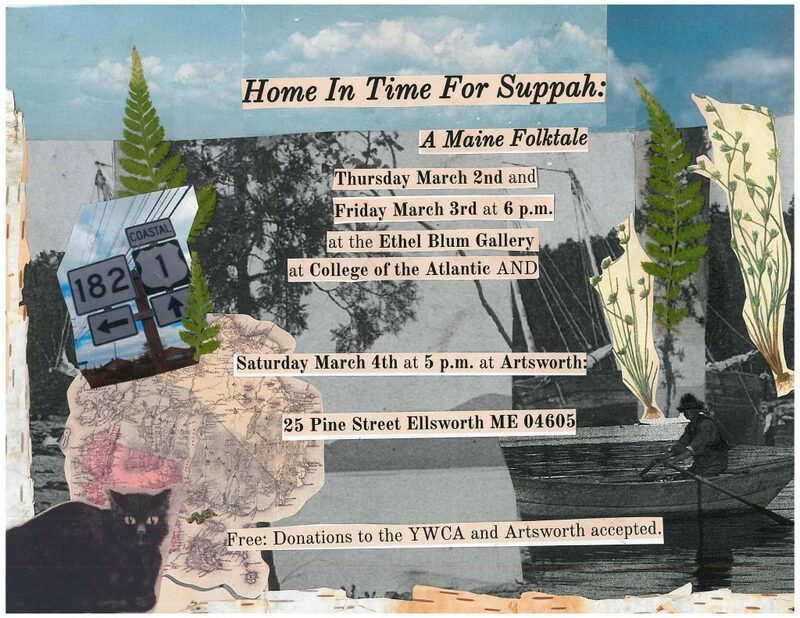 Based on an interwoven collection of Downeast tall tales, scout songs, and the work of Maine’s Queen Poet: Edna St. Vincent Millay, and featuring talented actors aged 8-22, Home in Time for Suppah ensures that the legends of this coast shall be as immortal as any ghost. Come enjoy warmth, comedy, and adventure! This event is free to the public, although we will be accepting much appreciated donations to Artsworth and the YWCA; suggested donation: $10. Donations from all three performances will be split between the two organizations, who have partnered with Sophie to provide practice and performance space for this production. Sophie Cameron, a Senior at the College of the Atlantic, developed this production as her senior thesis. It is a culmination of several years of work and academic study in theatre and childhood education. 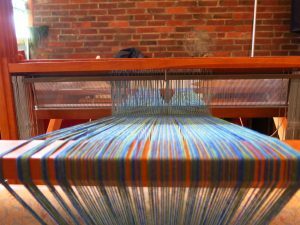 This workshop is designed for beginners or anyone wanting a warping refresher. All levels are welcome. Students will choose yarns from our supply to create a one of a kind textile, such as a scarf, table runner or hanging fiber art by combining yarns of different weights and colors. Weave fabric to adorn your home or body while learning how to thread your loom, or ours. 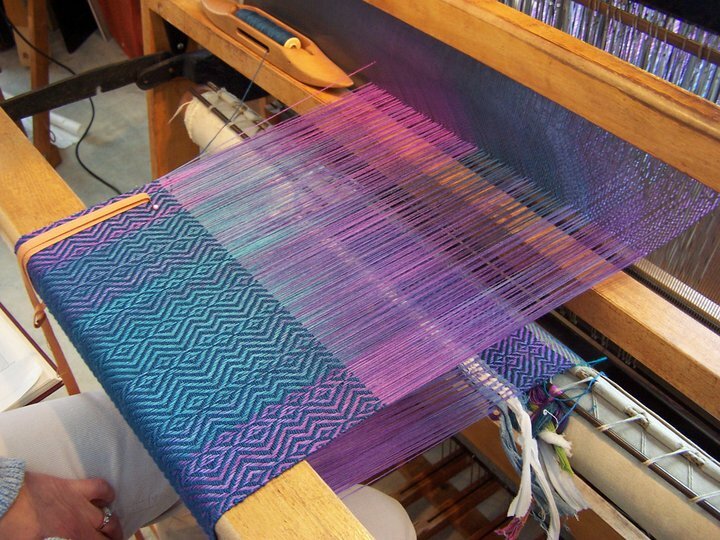 You will have access to a warping board and warping mill, and will learn how to use your tabletop to make a warp. Next a large variety of yarn and fiber of all types, colors and weights will be made available to you to use in your "scarf". Susan Perrine will show you fun and useful new techniques like creating a buttonhole, tapestry weaving, and lace insertion. 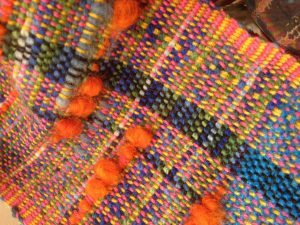 Think of this workshop as a kind of weaving sampler, where you can explore different techniques and traditions that speak to you with Susan's expert guidance. You may not finish your piece during the workshop. 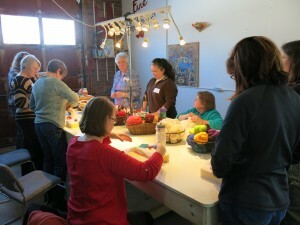 But we plan to have our weaving studio open for students to continue during the following 3 weeks. More information on open studio time will be discussed during the workshop. Students will make small warps with about 100 warp threads/ends. (about 3-3 1/2 yards by 9 inches wide). All materials needed to make a complete piece will be provided. Although, specialty yarns (cashmere, silk, hand spun yarn, etc...) will be available for an additional cost. Call 207-664-0222 to reserve a spot on our wait list. Come play with vivid color during these first muddy days of spring. 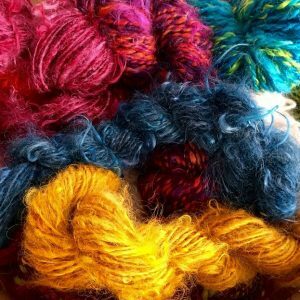 This is an acid dye workshop designed for beginners or those looking to learn a few new skills Julie will offer instruction on various dyeing techniques and offer guidance as you create your very own one of a kind fiber piece. This project is sure to help brighten up your future fiber projects. Julie Havener is a fiber artist, jeweler, and midwife that lives and works in Northeast Harbor. Julie will provide all the necessary equipment for this 4 hour workshop. Bring your enthusiasm and wear clothes you won't be afraid to get a little messy in. This class has been temporarily postponed until further notice. Please call 207-664-0222 for more information . 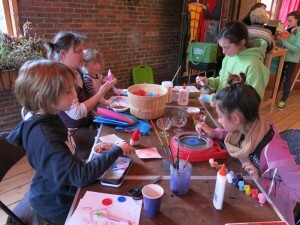 Private lessons with Tara are also available upon request, Tuesday–Saturday for $60 an hour with a two hour minimum. If you've taken a workshop with Tara before, this is a great opportunity to get more hands on experience and guidance. It is also a great option for beginners looking for a better schedule fit. Call 207-664-0222 to schedule your private lesson. Celebrate the arrival of spring and Earth Day with us as we help you make a colorful glass flower that will stay in bloom no matter the season. This experience will take approximately 20 minutes, and pre-registration is required. Participants will sign up for an hourly time-slot between 10 a.m. and 2 p.m. This experience allows you to work with hot glass up close, while staying on the cool end of the glassblowing equipment at all times. You'll start by choosing the vibrant glass colors you want to use in your flower and a colorful marini that will become the flower's center. You will then partner with our professional glassblowers to create it. After you apply the color, the glassblower will help you guide the molten glass into an optic mold, where you will shape the flower's petals by blowing air through the blowpipe. After you and the glassblower have shaped your flower, it will be removed from the blow pipe and a glass stem will be added. Your completed flower will then be placed in an oven to begin an overnight slow cooling process. Flowers are ready for pick up the following week or may be shipped for an additional fee within the US and Canada. 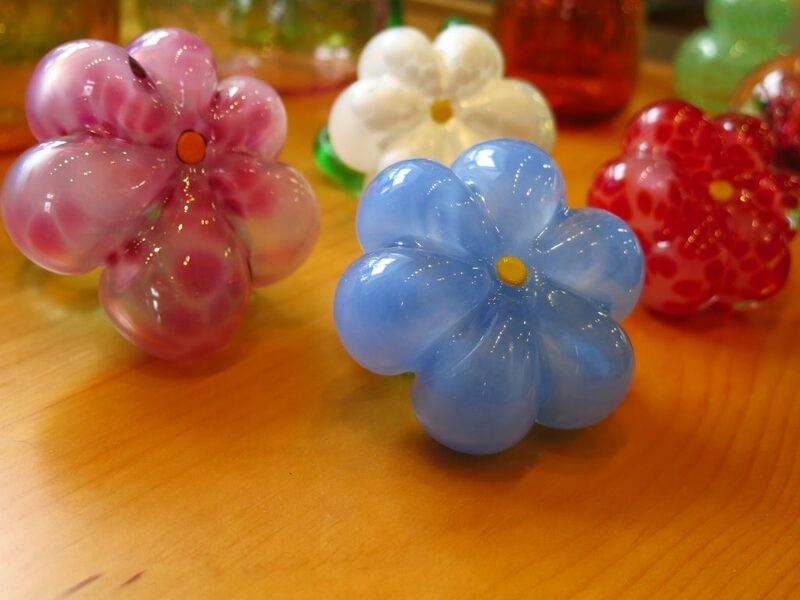 Call 207.664.0222 to sign up to make a glass flower with us. Minimum age 14. Participants under 18 must be accompanied by an adult. 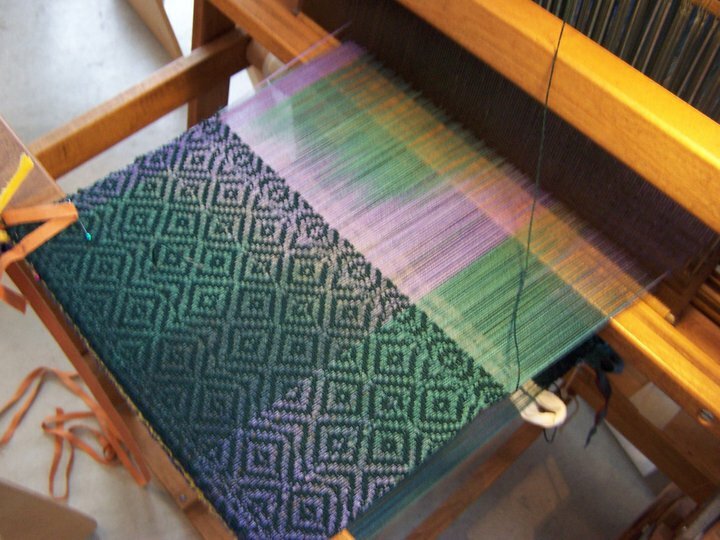 This tutorial with master weaver Chris Leith of Eggemoggin Textile Studio is an opportunity for students from our Warping Weaving Workshop to advance their study and gain more technical knowledge as they tackle new weaving projects. The four hour tutorial will focus on weave structures and the challenges of designing a project. Students can expect to learn about some of the weave structure families, including: plain weave, twill, lace, and double weave. We will also compare commercial and handwoven samples made with different fibers and yarns. Our discussion will focus on how various cloth structures are used and the weaving notation (draft) for these structures. This tutorial will help new weavers understand new structures, and affirm that they are less confusing than they may look! The second portion of this tutorial will focus on the challenges of designing a project. Selecting a pattern and materials leads to all kinds of other decisions. Chris will help explain how to navigate these decisions as you move forward with your design. 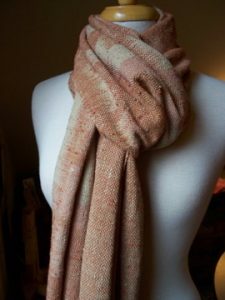 We will go through various approaches to planning your project, including ways to design an interesting warp without breaking the bank (How much yarn should I purchase?) and the importance of sett (ends per inch or EPI). This portion of the tutorial will also include some practice project worksheets. Call 207.664.0222 to reserve a spot or click the button below. Join Artsworth and dynamic duo musical act Hymn for Her as we boogie down in celebration of Maine Craft Weekend! 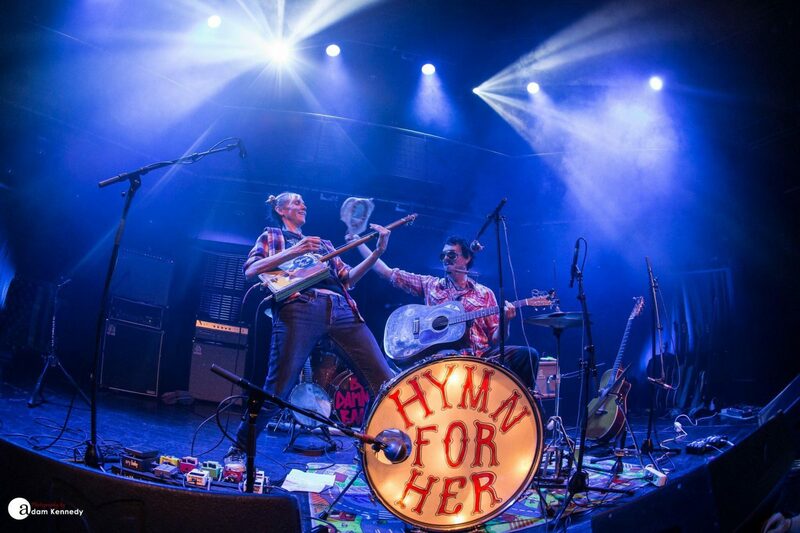 Hymn for Her's sound draws on inspiration from blues, country, and punk, and has been described as "Hillbillies with electronics opening Pandora's Box." Their 3rd release, Lucy and Wayne's Smokin Flames, was described as a riotous, socking roadkill stew" by U.K. music critic Steve Bennett. Hymn for her has been touring their unique sound across the country and abroad for the past few years. Before they hit our Ellsworth studio on October 13th, they will have toured in Italy, Germany, and many states along the east coast. We can't wait to get groovy Artsworth style. For a sneak peek, click the links to hear their music on their website or on their Facebook page. Tickets are $20.00 and can be purchased online at brownpapertickets.com. You can also drop by our space at 25 Pine Street to buy tickets or give us a call at 207-664-0222. Come join us! For the 8th year, we open our doors and welcome you to an event full of fiery energy and creativity. FireGathering 2017 at 25 Pine St., Ellsworth, ME hosts a marketplace featuring work by local artisans. This is a great opportunity to get last minute Holiday gifts for loved ones or for yourself! At this annual event we share our love of the fire arts with you as we do demonstrations of glassblowing, blacksmithing, pottery and torch-working. 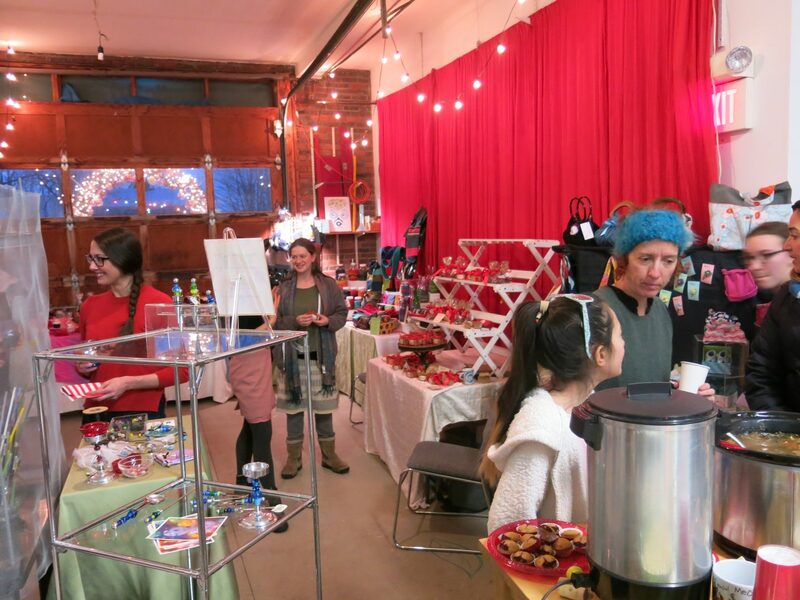 This open studio event is our way of saying "hey neighbor, come gather around our hearth! Let's enjoy community and creativity together as we beat back the cold and dark of approaching winter". This year we will have a large 4 harness loom set up so you can try your hand at weaving! Come warm yourself by our fires (and wooly fuzz) and welcome the winter with us. The Firegathering continues to bring new offerings to the Annual solstice celebration. Enjoy the Firegathering Marketplace 10am-4pm, check out the work of over a dozen artisans, many of whom will be happy to show you how they make their work, meet Fogtown brewers and taste the craft beer they made especially for the Firegathering, grab a bite at the pot luck & from some sausage makers barbecuing next to the coal forges and be ready to dance it all off in the evening (at 5-10pm) to the music of Hymn for Her in the brick ware house!! Gathering, as the season changes before we turn inside to our studios, homes and hearth, is important to connect with those we hope to get" hygge* with"! *(“hygge,” a Danish term defined as “a quality of cosiness and comfortable conviviality that engenders a feeling of contentment or well-being.” Pronounced “hoo-guh,” the word is said to have no direct translation in English, though “cozy” comes close. It derives from a sixteenth-century Norwegian term, hugga, meaning “to comfort” or “to console,” which is related to the English word “hug.” Associated with relaxation, indulgence, and gratitude, The dark winter can be cold and bleak, with long hours of darkness and, in some of the northernmost regions, shortened days of sunlight. In Denmark this helped turn "hygge" from a mere word into a kind of cultural panacea, manifested in various ways to buffer against cold, solitude and stress...."
"Firegathering" just might be the new english word for "hygge" don't you think! ?